One of the most popular decorative features to any special event is fabric draping - also known as Pipe and Drape. Colorado Event Productions provides event fabric draping decor accent services, in a choice of black, solid white, sheer white (voile) or ivory fabric from as little as 7 feet high to 22 feet high. Wall or Ceiling Fabric is the perfect addition for elegant events and weddings. -Or- Add a Cabana for an VIP area (see ideas below) of any event! Fabric ideas for decor, entry ways, wall fabric, fabric swag accents, spandex shape backdrops, decorative stage backdrops, decorative ceilings are almost endless! Colorado Event Productions takes fabric a few steps further and also offers LED Sparkle Drape (color and speed controlled twinkle on black fabric drape) , LED Full Color Backdrops and LED Animation (programmable) Backdrops! 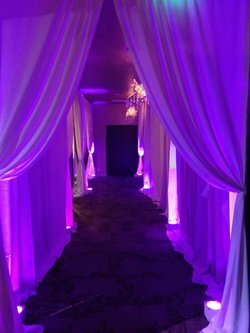 Remember: Special Lighting can be added to any event design or fabric option! See more options HERE or click any image to enlarge to full size! There is no more elegant way to showcase your event than by adding decorative ceiling fabric! Add Lighting, Bistro Strand Lighting or other elegant options to your ceiling draping or ceiling fabric design. See our event lighting page for more details and ideas! Start your event on the right note right as your guests walk in the door with Decorative Entry Fabric Design! Make a full room change or one wall as a focal point. Fabric is not only functional, but can also be decorative to your event design (swag back, layered fabric design, cabana design, stage backdrop and so much more! Decorative Fabric is also known as Pipe & Drape. We offer Black Pipe & Drape rental, Sheer White Fabric Rental Decor and Ivory Fabric rental. White and Black LED Sparkle Backdrops are also available! All pictures used on our websites are from our actual events! Fabric Accents, Fabric Panels, Spandex Backdrops, Beaded Curtain Backdrops, Stage Backdrops, Wedding Arbor and more! Fabric can be customized to your taste, style and special event design! Control the color(s), speed and "sparkle" of our black LED Sparkle Drape. 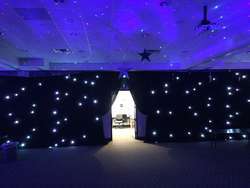 (White Twinkle Drapes available) Show images and text with our LED Animation Curtains. Impress your guests with a cool LED Backdrop with pattern, shape and color! In any case, these LED Backdrops are Awesome!! We've got your LED Draping covered! Lighting is Colorado Event Productions specialty and these LED Fabric Backdrops are no exception! Still need more? Check out our Animated & Digital Backdrops HERE! Not seeing what you are looking for? Send us your ideas! 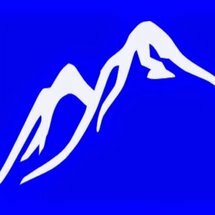 We are excited to see them and help make your visions and dreams a reality!